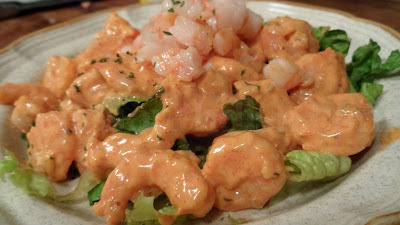 Cold cooked shrimp are dressed up with a tangy remoulade sauce and served over a bed of lettuce. A popular appetizer, shrimp remoulade is simply cold shrimp, doused in remoulade sauce and generally spread over a simple bed of crisp lettuce. That's pretty much it, because the tangy, spicy remoulade sauce speaks for itself. I prefer to prepare the remoulade sauce in advance on its own and let the flavors marry for a day in the fridge. Then, the next day, I cook the shrimp in a skillet of hot canola oil, just until done. Let the shrimp cool, then toss them with enough of the remoulade sauce just to give the shrimp a nice coating. Extract the shrimp, letting the excess sauce drip off and then arrange them on a bed of nicely shredded romaine lettuce. You can also add the slightly undercooked shrimp to the remoulade sauce when you make it a day ahead, toss the shrimp with enough of the sauce to cover them well, stir in the juice of one lemon and let them marinade overnight in the fridge. The citrus will help to finish cooking the shrimp and they will soak in some of the flavors of the marinade. A very popular way to serve Shrimp Remoulade is over fresh from the fryer, fried green tomatoes. They are the perfect vehicle. The combination is also pretty good on a sandwich roll though, or slid in between slices of fluffy French bread. But please ... just promise me you won't call it a po'boy. Pat shrimp until well dry. Heat 1 tablespoon of the canola oil in a cast iron skillet over medium high heat. Add the shrimp, cooking in batches and adding oil as needed for each batch. Lightly brown the shrimp on both sides, remove and set aside to cool, reserving a few of them to chop for garnish. Transfer the shrimp to a small bowl and spoon the remoulade sauce over them; gently toss. Shred lettuce and place onto individual serving plates and remove the shrimp one at a time, allowing excess sauce to drip off. Arrange the shrimp on the shredded lettuce, top with a few of the reserved chopped shrimp and a sprinkle of parsley. Serve in martini glasses for a very nice presentation. Also great over fried green tomatoes, on a sandwich roll, or slid in between slices of fluffy French bread. You're on a roll today and this is on my to try list. Remoulade sauce.. I love it.. This showcases it wonderfully! I love love love shrimp remoulade. I've been meaning to make my favorite recipe and blog about it. Mine is a three day process and always a crowd pleaser. Especially around here where alot of people have never heard of it. Yum...this looks so good, and it's pretty too! This is another dish that I have not had, but want to try. I made the Shrimp Po'Boy with the Remoulade sauce this past weekend and it turned out wonderfully. Thanks so much for your great recipes. I have found so many great things to make from your Deep South Dish web page. Keep up the excellent recipes.